Dr. Pantea Khazraee has been practicing general dentistry in Port Orange, Fla., for over 17 years. She finished her premedical studies at the University of Maryland, College Park. Here she was awarded the Golden Key Honor Society membership. In 1994, she obtained a Doctorate of Dental Surgery degree from the University of Maryland Dental School in Baltimore. She is married to Aram and has two children, Arman and Armeen. In her leisure, Dr. Khazraee enjoys boating and home cooking. Dr. Khazraee has a passion for learning and is committed to excellence in the practice of dentistry. 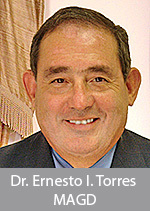 Dr. Ernesto I. Torres has over 30 years of experience in general dentistry. He completed his BS at the University of Iowa in 1975 and received his DMD from the University of Puerto Rico in 1979. Following graduation, Dr. Torres joined the U.S. Navy Dental Corps and worked as a general dentist until 1982. He holds a Mastership in the Academy of General Dentistry, the highest level of recognition for continuing dental education, awarded to less than one percent of U.S. and Canadian dentists. He has completed all continuums offered by the Pankey Institute for Advanced Dental Education, and he continues to attend courses there. He completed a one-year program of Implant Dentistry at the Boston Seminar of Harvard University in 1992. In 2001, he completed a post graduate program in Esthetic Dentistry at the University of Florida, Gainesville in addition to advanced TMJ training and mini-residencies in cranial facial pain. Dr. Torres has given back to his community, for over 15 years, through his work at the Duvall Home in Glenwood, Fla., an institution for handicapped children and adults. For the past 17 years, he has participated extensively in medical missions to Central America sponsored by St. Peter’s Episcopal Church of Lake Mary, Fla. He enjoys fishing, golfing and bicycle riding. He has been married to wife Annabella for 38 years, and he is the proud father of Ernesto, Anabella and Ruben (deceased). His goal is to establish long lasting, comfortable relationships with his patients. He prides himself on staying on the cutting edge of dental technology and patient communication.